"Sally Wingert and Sara Marsh's intertwined performances reveal a beautiful, upsetting play. [...] In addition to the spare excellence of her performance, Marsh designed the set [...] Director Hayley Finn and the actors have pitched the performance perfectly for Dark & Stormy's intimate space, where we can see Wingert's face express every one of the five stages of grief, and even a few new ones. [...] the actors are so strikingly in tune with each other […] It is so minutely detailed in the emotional shifts of its characters and so up-close and personal, that each audience member is asked to bring their own unique experiences of grief and loneliness to bear on it - and part of the enduring strength of the play is that there is so much room in it for all of us." "Every once in a while, a play is so perfectly cast that it would be hard to imagine, moving forward, ever seeing it with anyone else in the roles. [...] Put in the hands of the marvelously talented Sally Wingert and Sara Marsh, this sturdy play rises to a transcendent level. Wingert portrays Thelma without any vanity, stopping at nothing to convey a mother facing her darkest fear. Marsh manages to tone down her natural radiance and express the emptiness and resolution that guide Jessie's hand. [...] Dark & Stormy Productions knows how to work with this kind of challenging material, giving 'Night, Mother a definitive staging that will long be remembered as an example of the excellence found on Twin Cities stages." "Wingert, a consummate actor drawn to challenging roles, is heartbreakingly angry and confused as Thelma; a woman whose had her share of travails but won't relinquish her spark of life. Opposite Wingert, Marsh conveys an eerily upbeat resolution in the face of overwhelming sadness, a sort of reverse eclipse of the heart. [...] Marsh designed the set, with furniture suspended by wires to convey a sense of surreal drifting. Everything that Thelma thought she could rely on, from her daughter to the electric oven, seems poised to float away." 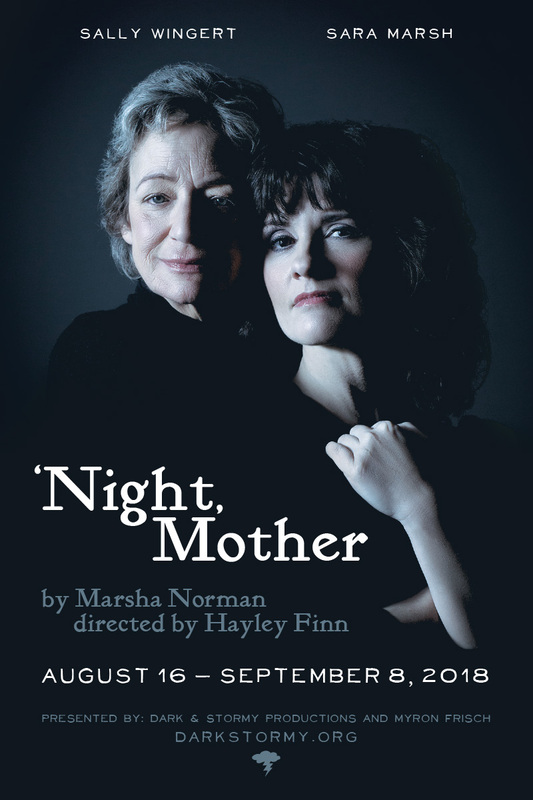 "'Night, Mother calls for actors who can handle the emotional demands and brutal honesty, who can convince us they've known each other forever and are standing together on an awful precipice. Wingert is, of course, Wingert, seen on Twin Cities stages everywhere because she's so damn good. Marsh steps into Jessie's shoes with fierce conviction. Both give tremendous and fearless performances." "I often say that two-person plays are my favorite...This is one such play, and both Sally and Sara give among the best performances I've seen from either of them. [...] This is not the first time these two have worked together, or played mother and daughter, and that shows in their intertwined performances that are a beautiful dialogue."